The MNPVHV series of combiners are manufactured for indoor / outdoor use and designed for combining high voltage strings using 10mm x 38mm fuses. 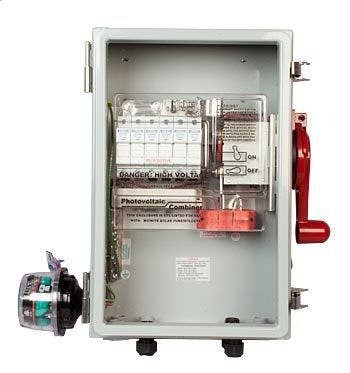 The use of touch-safe din rail mount fuse holders and fuses allow operation up to 600 Volts. The micro switch is available to run the Midnite Birdhouse directly from the combiner. Rated for 600VDC. The MNPVHV combiners are rated for outdoor use. Designed for combining high voltage strings using 10mm x 38mm fuses. The use of touch safe din rail mount fuses and fuse holders allows operation up to 600 Volts. The MNPV red handle is lockable in the off position.